Corruption spreads over Terrinoth! A disastrous star shines in the night sky over the kingdom, its coming announced by a flood of corruptive bursts. Friends will soon become adversaries, and even the greatest heroes are not immune to the evil powers of the sinister star. 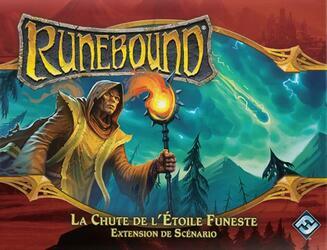 The Scenario Expansion The Fall of the Dark Star offers a novel scenario to experiment with in your Runebound games. Play as a new hero, experience incredible adventures and fight against decadence with the new Corruption card deck!